Born 27 May 1947th in Ljubljana. 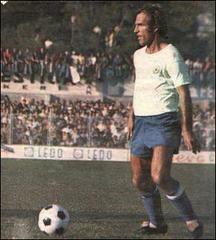 One of the best "connective" players in the Yugoslav football after the Second World War. He started to play 1963rd in the youth team NK Olimpija Ljubljana, 1966. he became a professional in the jersey "zmajcek" played prvenstvenih 350 and about 300 other games, scoring 52 league goals. Two seasons (1973-1975) played with great success for Hajduk Split (66 matches/24 goals), whose jersey was won twice, double crown "- winning the championship and Cup: 1973/74. And 1974/75 years championship and 1973rd and 1974th Football Cup of Yugoslavia. He pointed out also in Germany where he defended the team colors Bundesligaša FC Schalke 04 (1975-1977) for which he played 49 games in the Bundesliga and scored five goals for FC Bayern Munich (1977-1980) in which it played a 71 game jersey and scored five goals. For a time he paused, and from season 1983/84, he played for FC Spittal Austria drugoligaša the same city, and from March 1985th there was a technical director on duty Olimpija Ljubljana. With six games for a young team (1968-1970), for which he scored a goal, played and 46 games and scored six goals for the best selection of Yugoslavia. Debuted on 6 May 1970th in the match against Romania (0-0) in Bucharest, and settled in the national team when he became coach Vujadin Boskov. He participated in the 'Cup of Independence of Brazil "in 1972, where the famous Pele farewell and' silver jubilee" in the team celebrated its 13th great game February 1974th in a memorable, Mistress "against Spain (1-0) in Frankfurt, and the last game in the jersey with the emblem of the state occurred on 8 May 1977. against Romania (0-2) in Zagreb. He participated at the World Championships 1974th in Germany (he was elected the best team in the World Cup) and at the final tournament of the European Nations Cup 1976th in Belgrade and Zagreb. He and Popivoda Slovenians were the first who played at the World Championships. His assistance to the first goal in the semi-finals match against EP 1976th against the Germans, is still remembered among football experts. After a football career, he was the coach. Twice he led Olimpija Ljubljana, and was a youth team coach of Slovenia, to May 2004. was chosen for the selectors with a selection. On the occasion of 50 years of UEFA, was declared the best players of all time ahead of Slovenia's Srecko Katanec and Zlatko Zahovič.